Kern Co., CA Between Walker Basin Creek and Caliente. CNPS Chapter Field Trip, 24 May 2013 Cercocarpus betuloides-Ceanothus cuneatus--Quercus wislizenii-Garrya flavescens montane chaparral. Kern Co., CA Between Walker Basin Creek and Caliente. CNPS Chapter Field Trip, 24 May 2013 (R. Spjut, C. Golden, L. Clark, Z. Principe, P. & D. Gradek). Kern Co., CA, Tehachapi Mts. 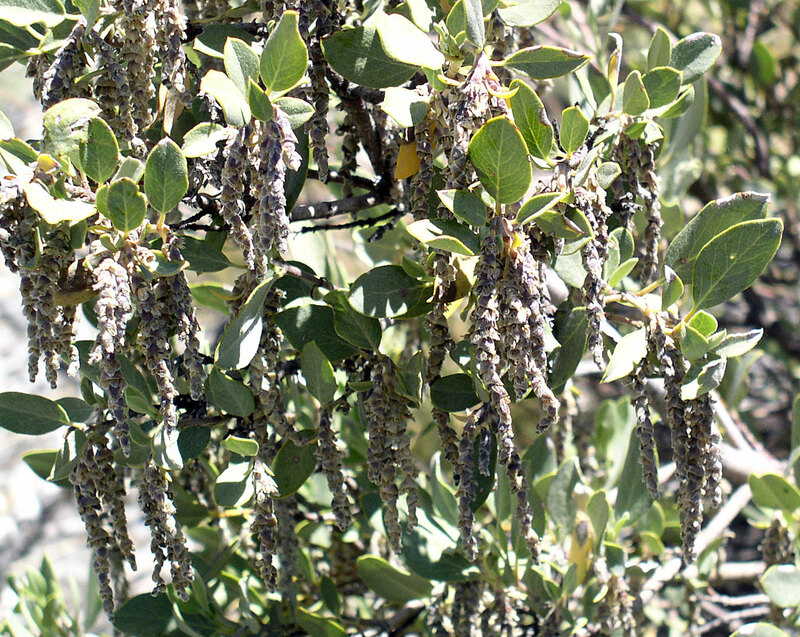 Garrya. 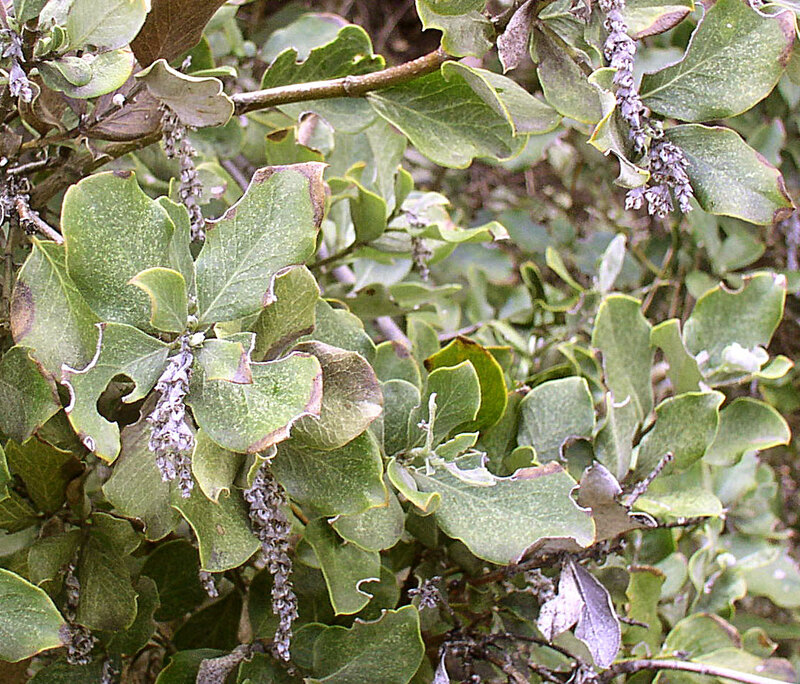 Evergreen Shrubs or trees; leaves simple, opposite, thick, leathery, short petioled; flowers in recurved to dangling catkins, the catkins often several or more together from leaf axils, or branched near base, individually small, without petals, male and female flowers on separate plants; male flowers clustered in cups formed by opposite joined bracts, the cups numerous and strung close together along catkins, each with (3-) 6 to 10 flowers, on a short recurved peduncle, with 4 sepals and 4 stamens, and a rudimentary pistil; female flowers nearly sessile or on a very short recurved peduncle, mostly opposite in pairs but appearing more clustered near base of catkin, subtended by deltoid bracts, which are joined at base, and recurved towards subulate tips, or appearing cupular in some species, petals 2 or none; gynoecium 2-carpelled, the ovary 1-celled, inferior, often fuzzy, with 2 persistent curved styles; fruit a berry or fleshy with a separable exocarp, or drying out, then breaking up irregularly; seeds 2. 14 spp. Western North America, Mexico to Central America and Greater Antilles. Species taxonomy has largely been weighted on the type of hair growth on the undersurface of the leaves, for example, whether the hairs are interwoven into a mat as in G. veatchii, or simply spreading straight and pressed to the surface as in G. flavescens (Dahling 1978). The California species apparently are not strongly supported by molecular data (Burge 2011). 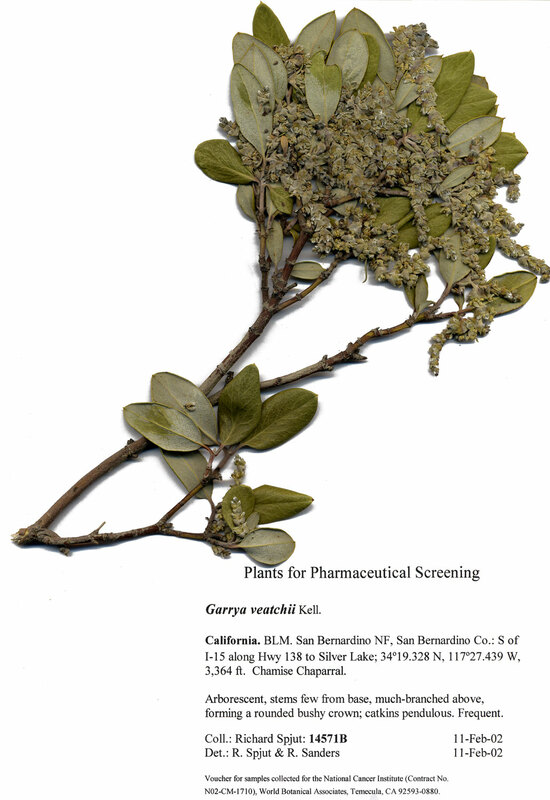 "Intergradation among" California species raises question about their species status (Thomas M. Daniel in JM2). 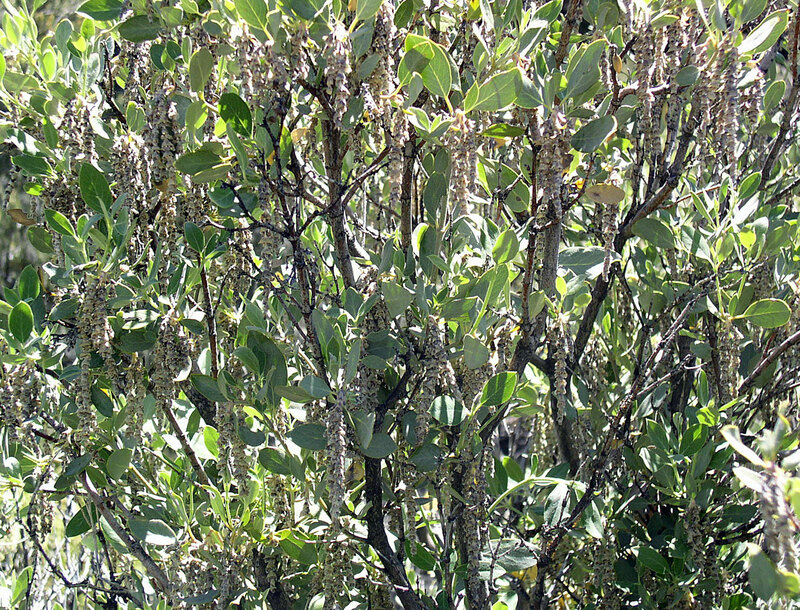 Garrya elliptica Douglas ex Lindley 1838. 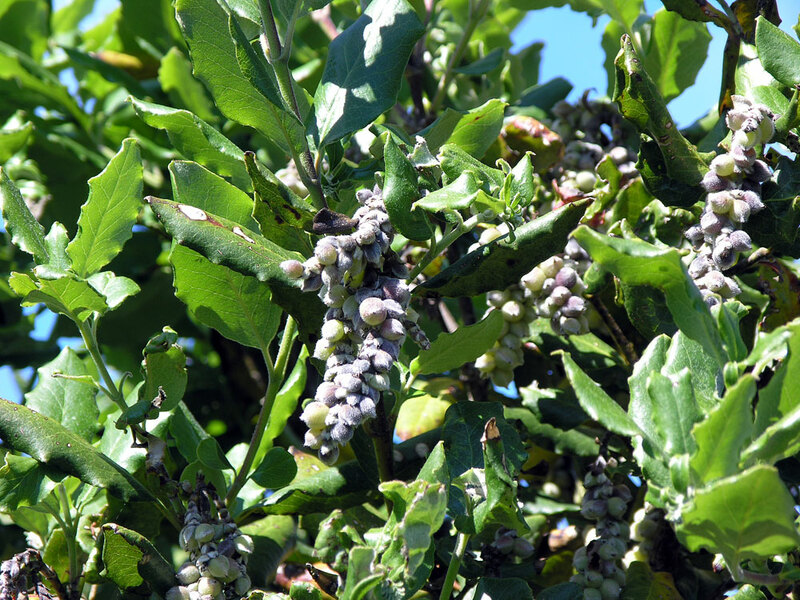 Large evergreen shrub, or tree with a broad hemispherical crown, to 9 m, often wider than tall; twigs rigid; leaves elliptical, thick, leathery, dark green and convex above, densely white wooly below, curled under and wavy along margins; catkins solitary or in clusters of 2 to 10, males 7–20 cm long; females 5–10 cm in length. 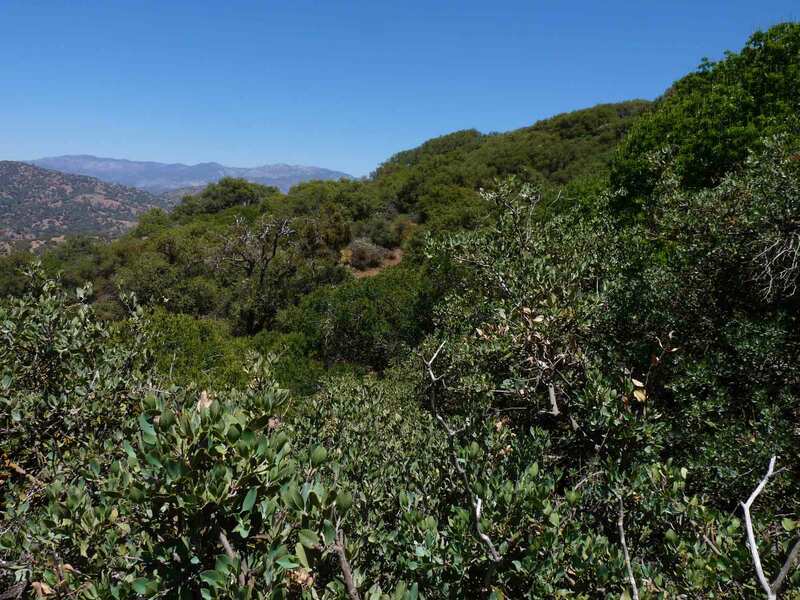 Mostly Coast Ranges from Lincoln Co. OR to Santa Barbara Co., CA. Type from Oregon [along the Umpqua River, about 20 miles from the ocean] or Washington near the confluence on the Columbia, on the south bow, noted by Douglas to be plentiful in rocky situations on the seashore, especially in California. Kern Co.: CCH: Cedar Creek Camp, Greenhorn Mountain Range, 4900 ft, Lyman Benson, 30 May 1937 (RSA). Clyde Golden (pers. comm. 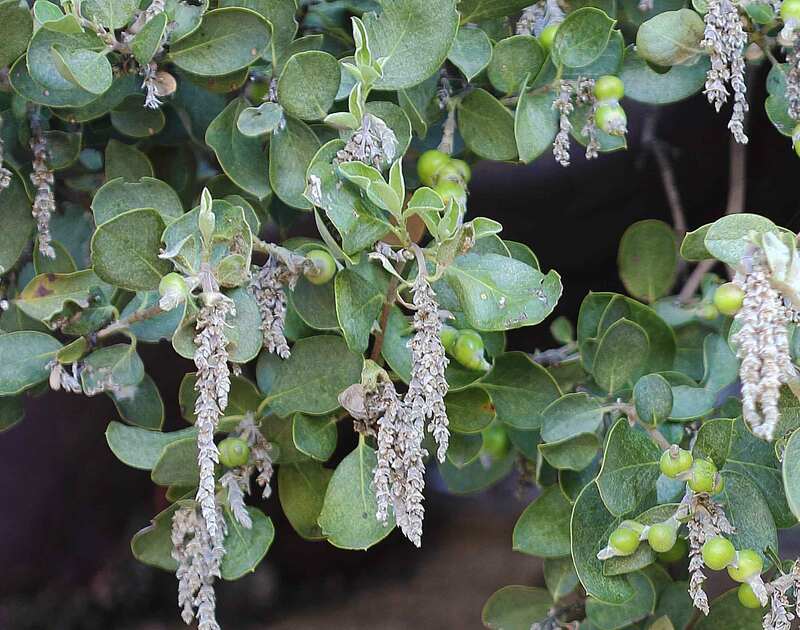 19 Apr 2014) reported finding a small tree of Garrya at Cedar Creek, which his photos of the plant appear not to be G. elliptica. 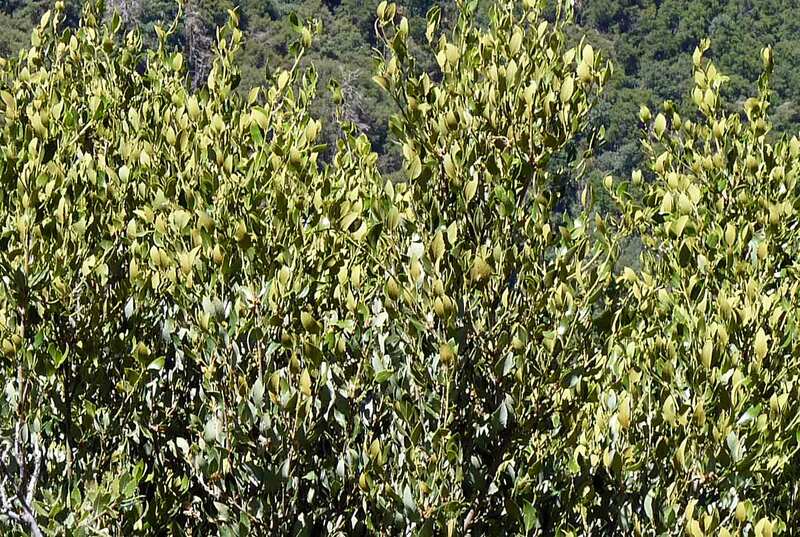 Garrya flavescens S. Watson 1873. 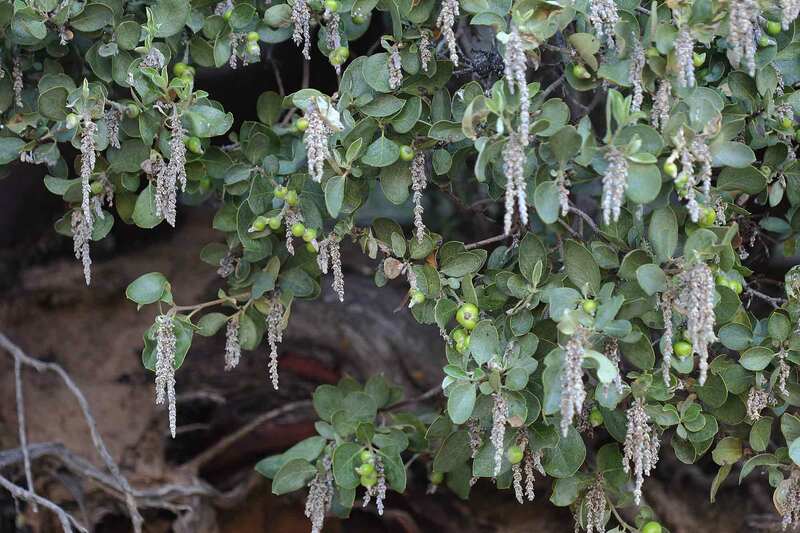 Silk tassel bush [Includes Garrya pallida Eastwood 1902, type from Kings River Canyon, Fresno Co., CA, distinguished as a subspecies by wavy hairs (Dahling 1978)]. 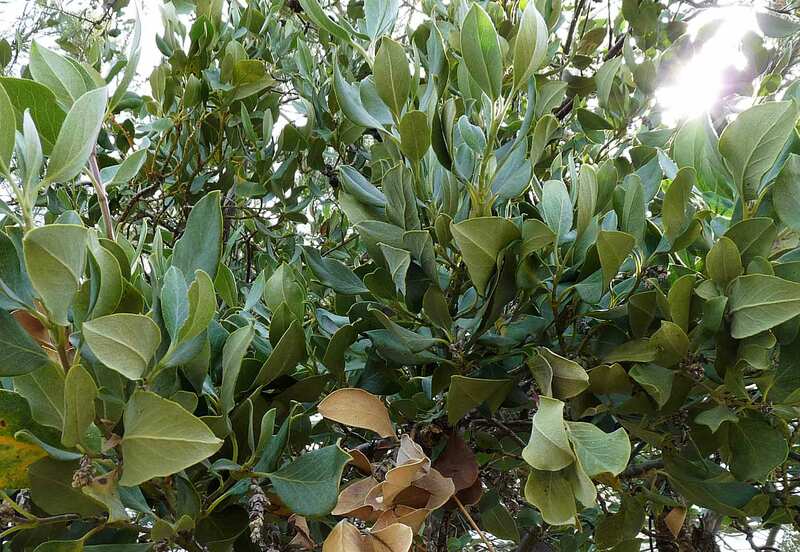 Large evergreen shrub, or small tree to 5 m high and broad, with stiff stems and opposite leaves, the leaves thick, broad elliptical to slightly wider above the middle, 1.3–3.3× longer than wide (2–7.5 cm long), plane to irregularly broadly undulate, obtuse or actutely tapered to a contorted apiculus; upper surface with promient tertiary undersurface sparse to densely hairy, hairs coarse, straight to curved, appressed towards leaf apex; venation; flowers Feb-Apr, dangling from branches in long silky tassels to 6 cm long; fruit berry-like, 7–9 mm, when young, blue to gray-blue, becoming dry at maturity, the pericarp irregularly breaking apart (foraminicidal capsule), dispersing two seeds. 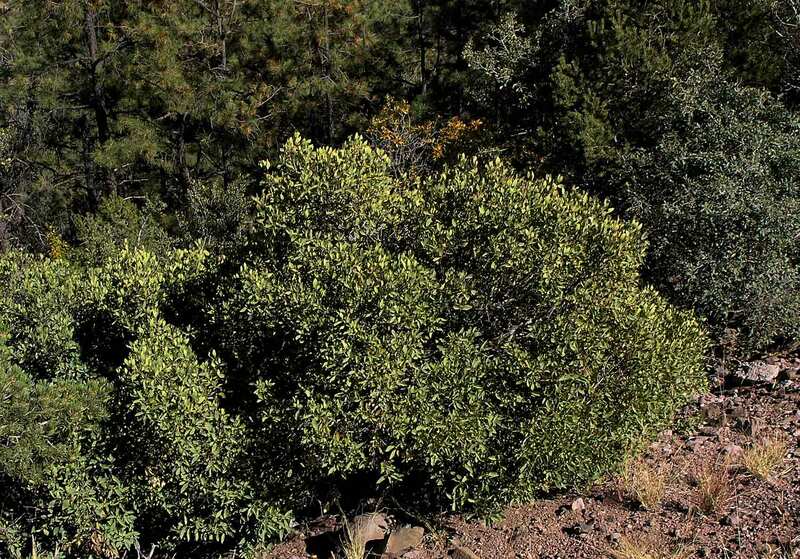 Chaparral of California, Nevada, Arizona and Baja California. Type from Kanab, UT. 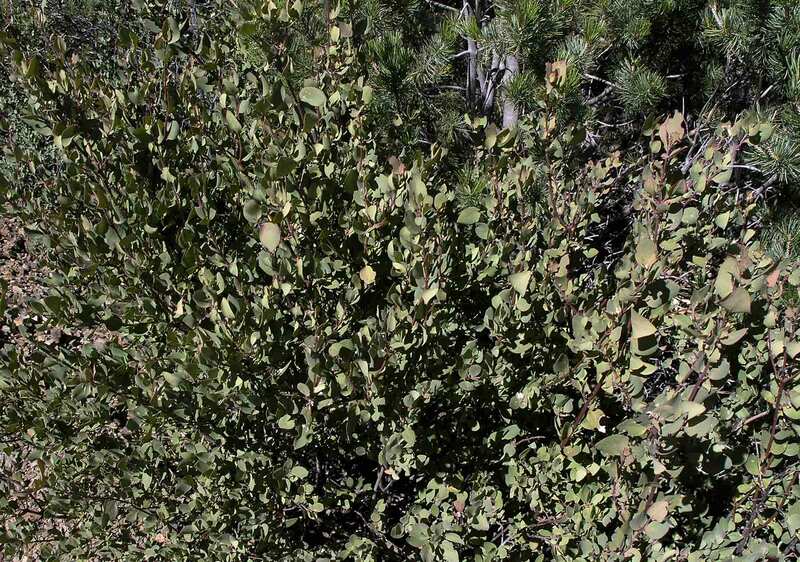 Kern Co.: “Occasional in shin oak brush and common in chaparral from the east slope (rare on the west slope) of the Greenhorn Range southwest through the mountains to the Mt. Abel region” (Twisselmann), 1,037–2,830 m (CCH). 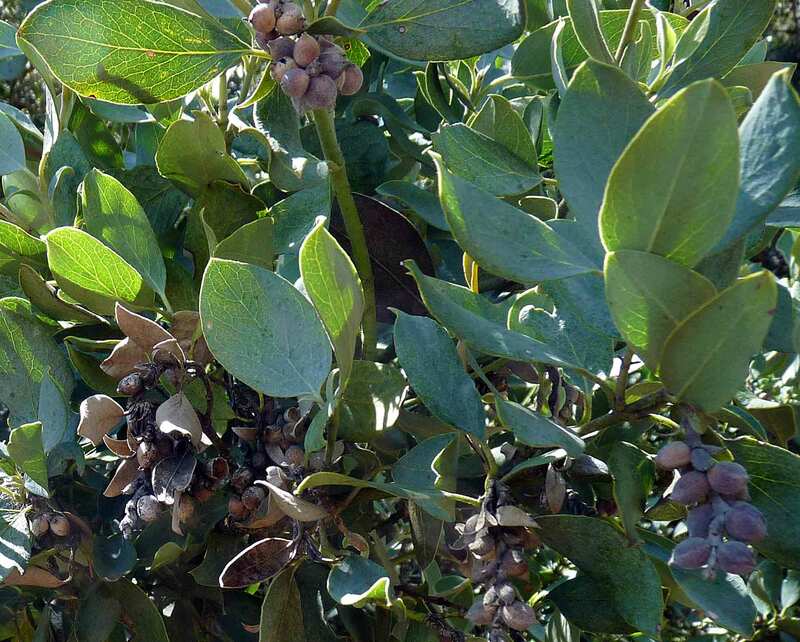 Kawaiisu applied infusion of leaves for gonorrhea, stomachaches, and as a laxative (Moerman). 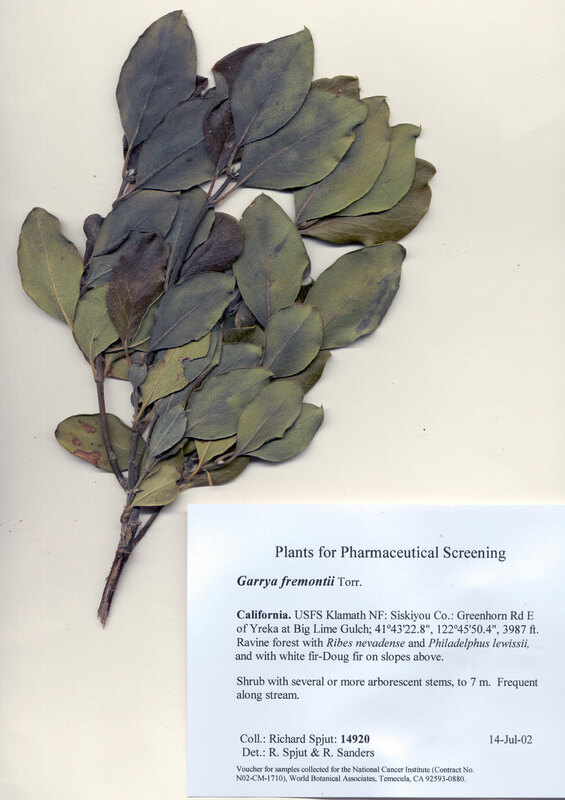 Garrya fremontii Torrey 1857. Fremont’s Silk tassel. 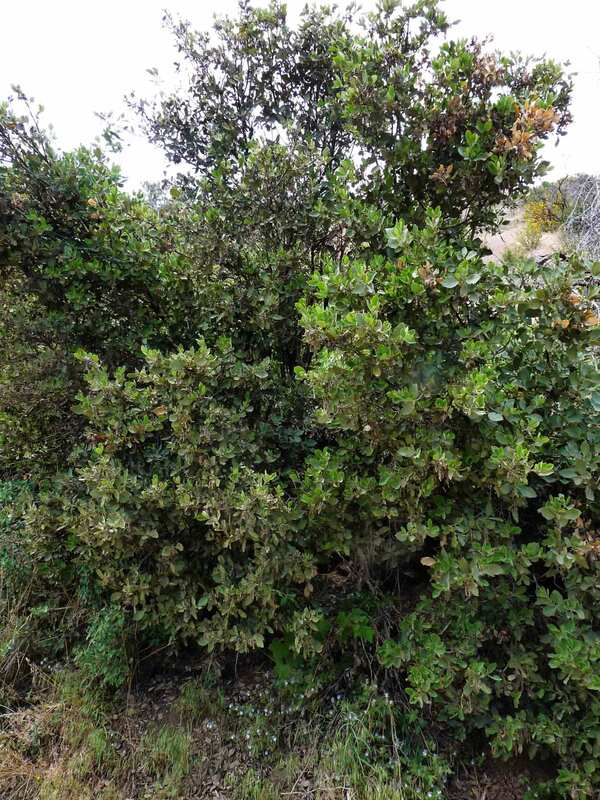 Shrub to 5 m; young twigs with appressed silky hairs, soon bald revealing reddish brown bark; leaves broad elliptic to almost round but tapering at both ends, 2.4–6 cm long, leathery, green and sparsely hairy above, yellowish green and bald below; flowers Feb–Apr; fruit catkins with leaf-like bracts; fruit bald, bluish black or purplish, 5–6, diam. Southern Washington to northern California with disjunct occurrences to Riverside and San Bernardino Cos. Not in Twisselmann or Moe. Type from “Small headwater of Cow Creek, Shasta County, California." 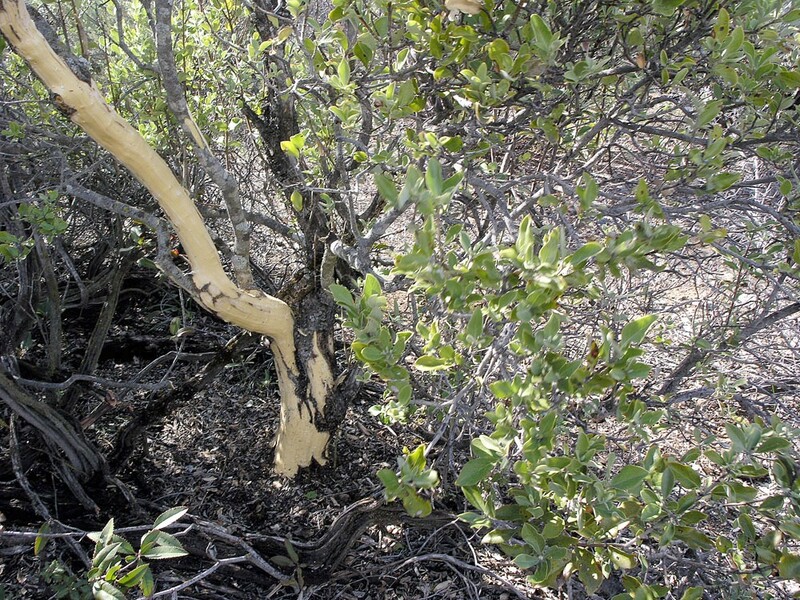 Kern Co.: Greenhorn Mts., Sawmill Road (Golden, photo, May 2012, identified Garrya, received and reviewed by Spjut, Feb 2013, pers. comm.). Also reportedly collected from Caliente, CCH: N. C. Wilson, 1893-01-16 (A401861). 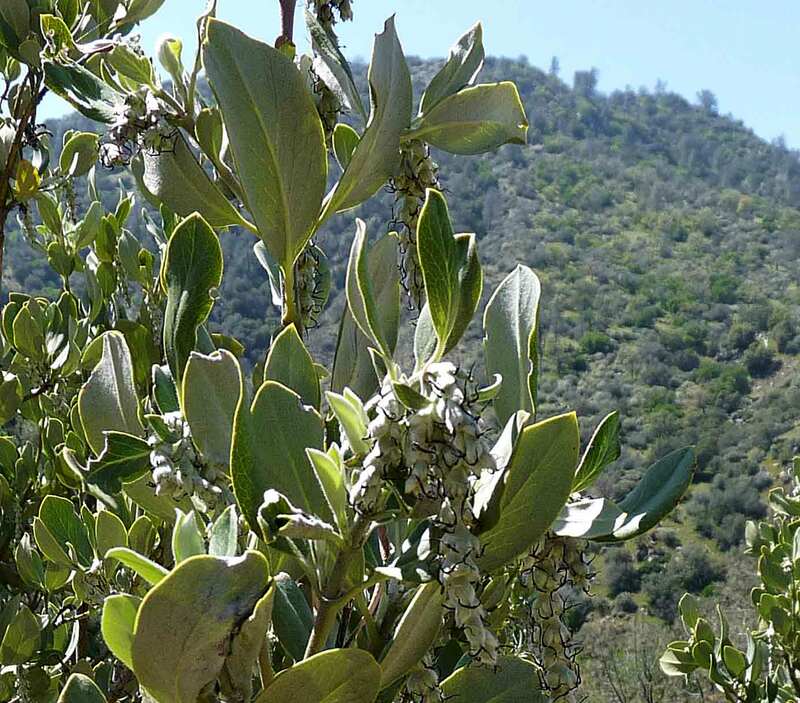 Apparently common in montane chaparral in mountains just north of Caliente, judging from the lack of the hairs on the leaf undersurface shown in one of the above photos. 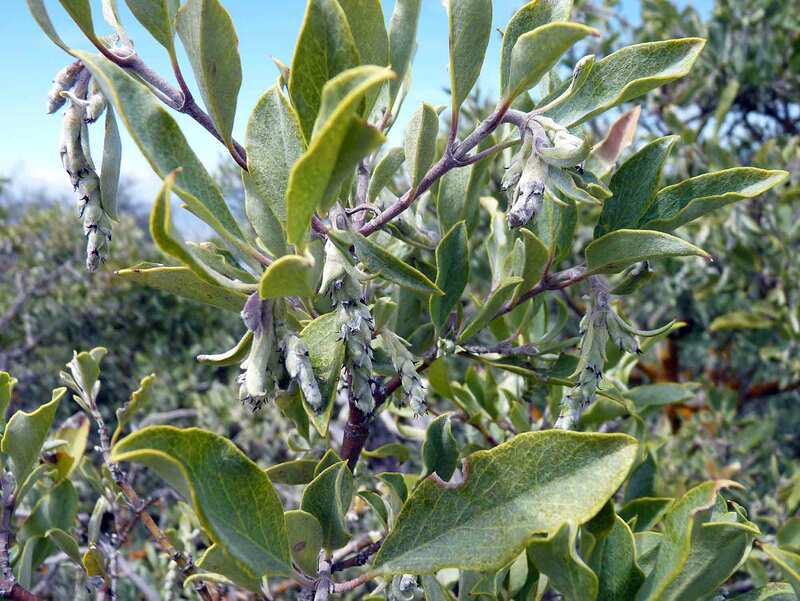 Garrya veatchii Kellogg 1873. 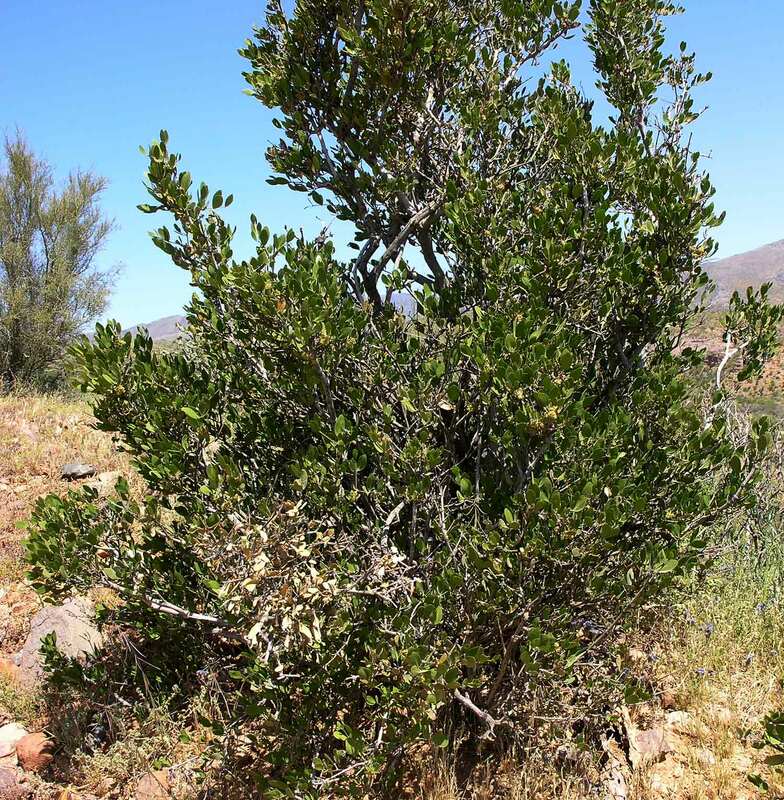 Shrub 1–3 m, young twigs densely covered with white curly hairs; leaves mostly erect or pointing to branch apex, the petioles spreading <45º, broadly sword shaped to nearly elliptical, 2.5–6.5 cm long, often broadly curved downwards lengthwise in mid to upper region and curved upwards across the blade in mid to upper region, broadly tapered to an obtuse apex, or ± acuminate (McMinn), or only the young leaves acuminate (Abrams illus.) 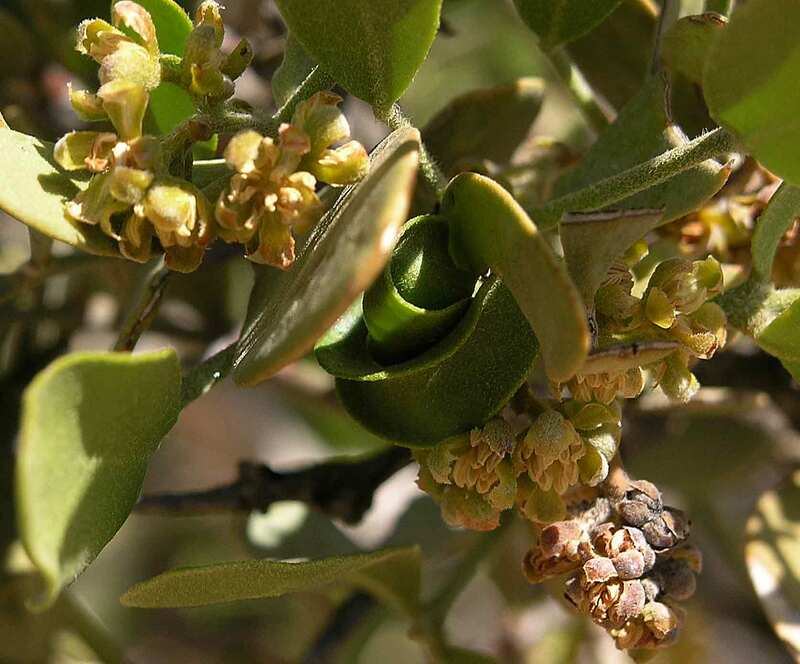 with an apiculus curved downwards; upper (adaxial) surface of leaves with conspicuous mid and lateral veins, tertiary veins obscure; catkins in clusters of 2–4; rachis of male catkins visibly white hairy; fruit ovoid, 6–8 mm, densely short hairy, hairs curly, interwoven. 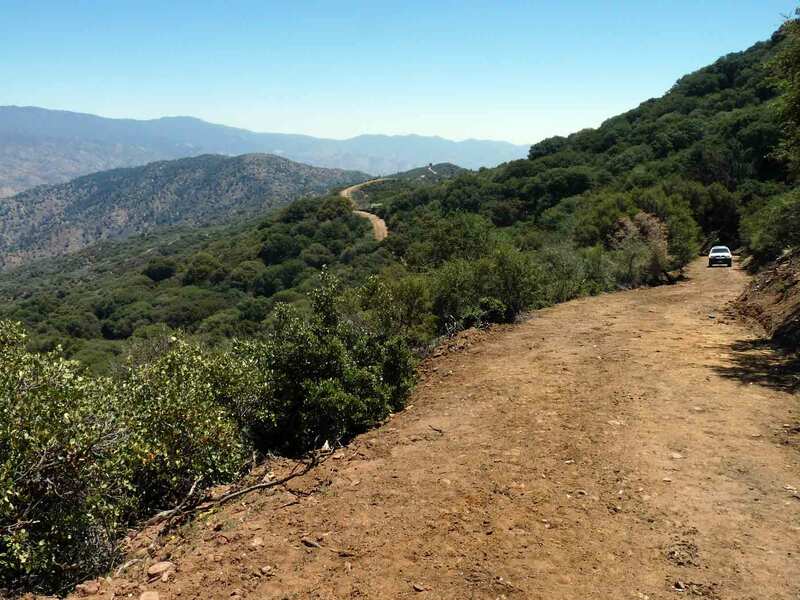 Desert or rain-shadow slopes of coastal mountains, northern Baja California and Peninsular Ranges in southern California to southern Coast Ranges in Monterrey Co., below 7,000 ft. Type from Cedros Island, Baja California Norte. 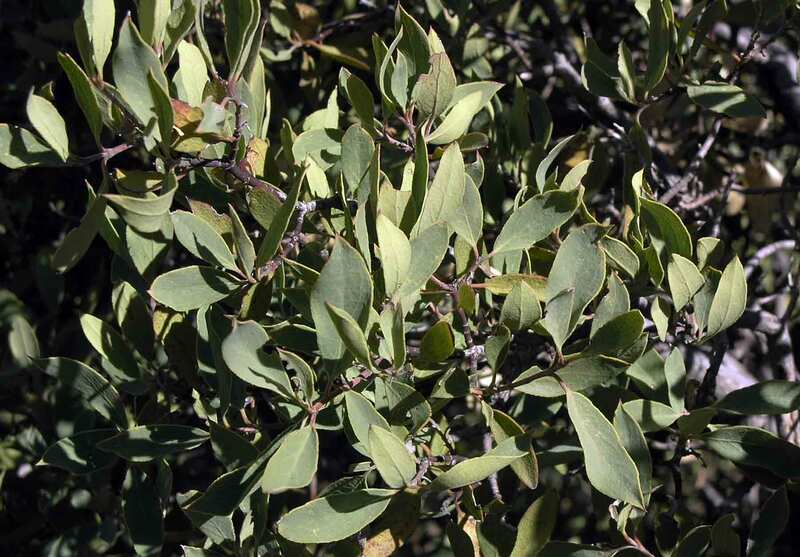 This species has not been reported from Kern County; however, plants observed on the Tejon Ranch Conservancy and along Mill Creek Trail appear to belong to this species by the strongly erect leaves. 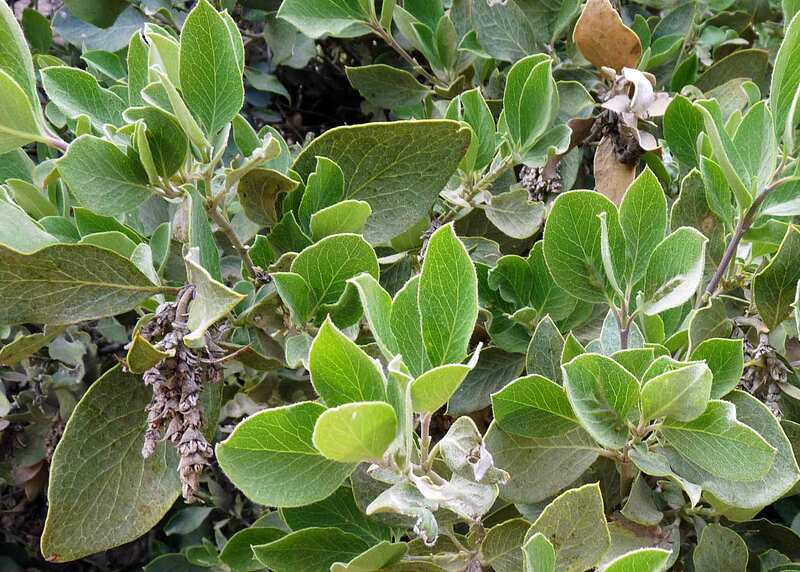 Munz differentiates the species by whether the hairs on the leaves are appressed and nearly straight (G/ flavescens) or curly (G. veatchii) whereas JM2 (also Abrams) makes a closer comparison to G. elliptica by the slightly curled under leaf margins and by the narrower fruiting catkins, 13–18 mm wide. The key distinction appears to be appressed straight hairs (G. flavescens) vs. interwoven curved hairs (G. veatchii). It remains to be determined whether this key difference correlates with the other differences given in the above key. Burge, D. O. 2011. 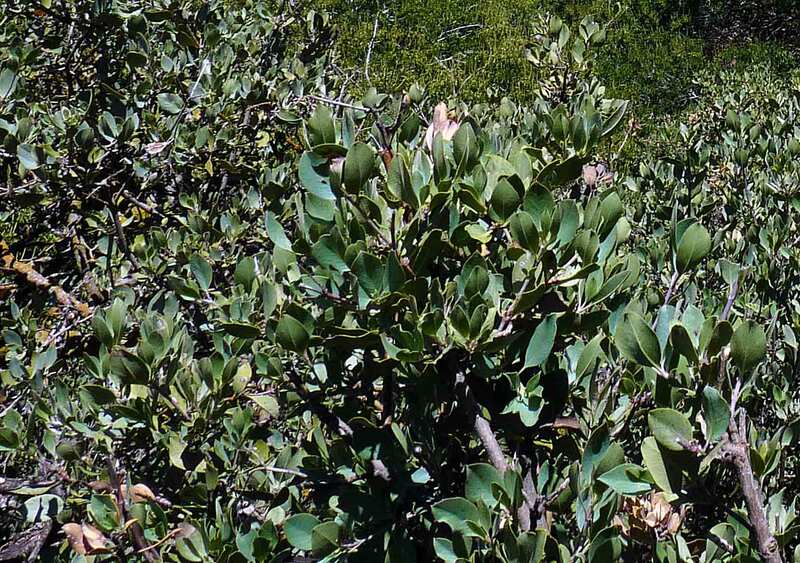 Molecular phylogenetics of Garrya (Garryaceae). Madroño, 58: 249–255. Chen, K. K., R. G. Herrmann and C. E. Powell. 1956. 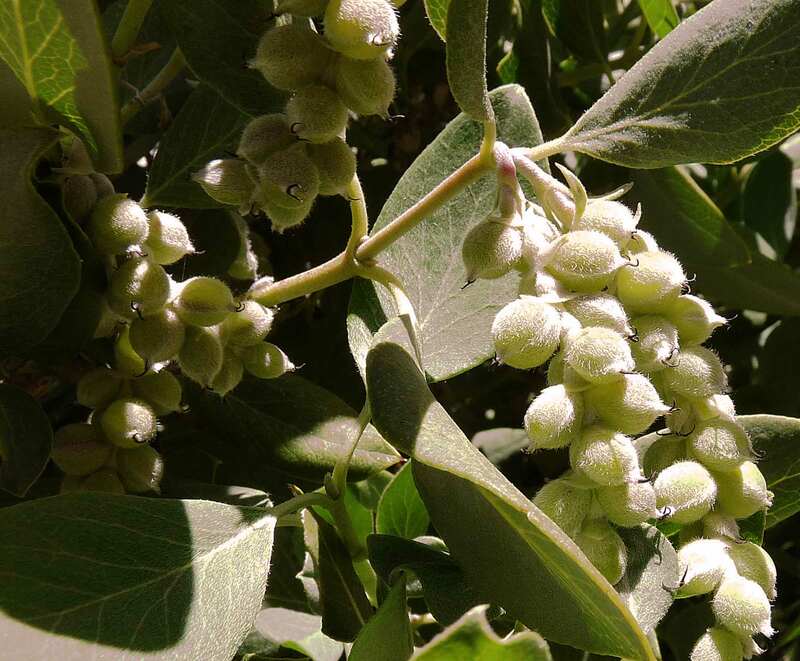 Pharmacological action of our Garrya alkaloids. J. Am. Pharm. Assoc Am. Pharm. Assoc. (Baltim) 45(11): 733-734. Dahling, G. V. 1978. 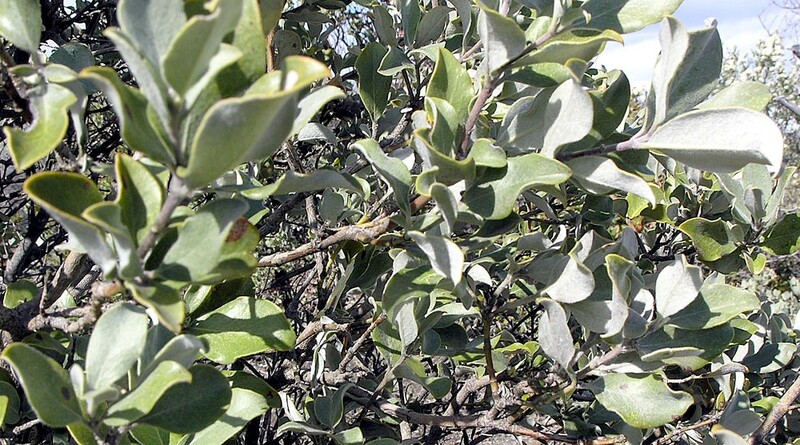 Systematics and evolution of Garrya. 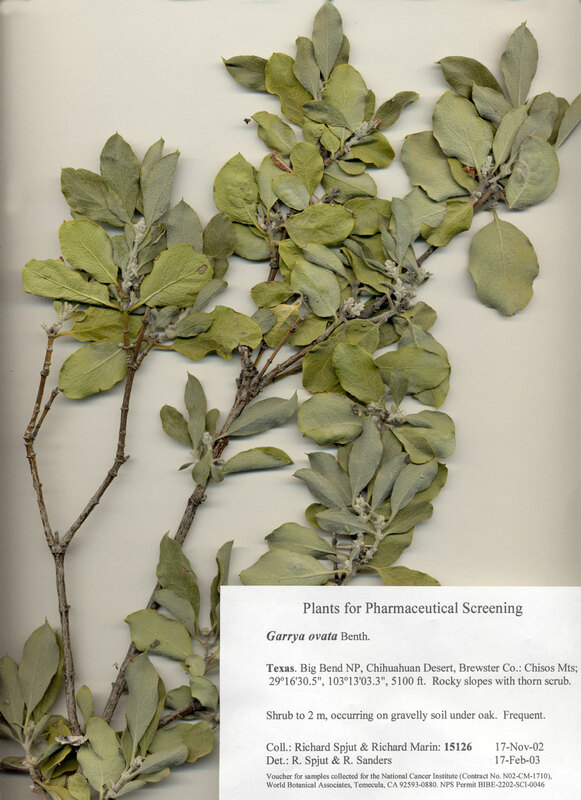 Contributions to the Gray Herbarium of Harvard University 209:1–104. Pelletier SW and D. M. Locke. 1965. The diterpene alkaloids. 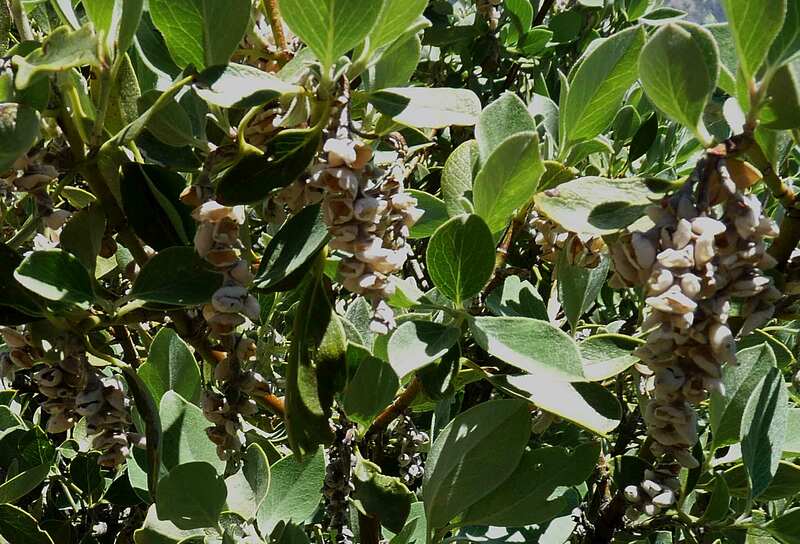 Correlation of the atisine and Garrya series of alkaloids. J. Am. Chem. Soc. 87: 761–776.